Download a blank fillable Dd Form 2993 - Environmental Baseline Survey (Ebs) Checklist in PDF format just by clicking the "DOWNLOAD PDF" button. 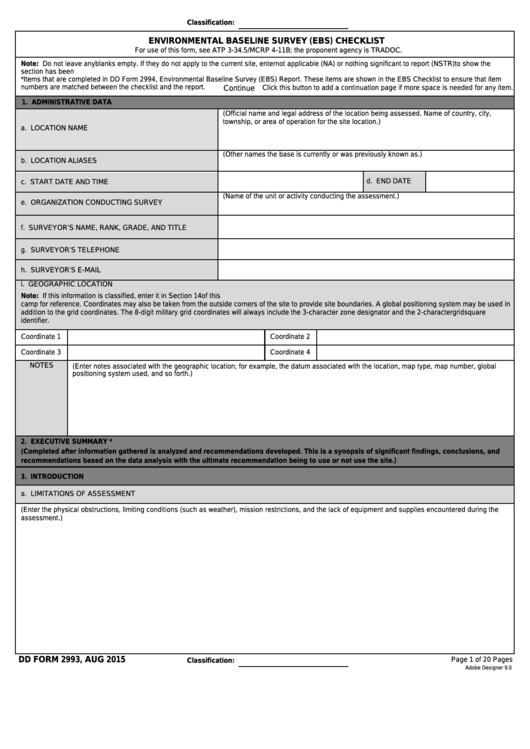 Complete Dd Form 2993 - Environmental Baseline Survey (Ebs) Checklist with your personal data - all interactive fields are highlighted in places where you should type, access drop-down lists or select multiple-choice options. For use of this form, see ATP 3-34.5/MCRP 4-11B; the proponent agency is TRADOC. section has been investigated. The section numbers in the checklist correspond to the section numbers in the report format. numbers are matched between the checklist and the report. Click this button to add a continuation page if more space is needed for any item.